Last week I chose Captain Britain & MI-13 #10 as one of my weekly picks. I enjoy reading about this ragtag group of heroes led by Pete Wisdom and Captain Britain who work together to preserve and protect magick in the UK. There is an awesome scene this week in which Storm returns the Ebony Blade to the Black Knight. T’Challa is conspicuously missing, but it’s nice to see Ororo ruling without her husband hovering around. She comes across like a true Queen. I especially loved new team member Faiza Hussain’s reaction to the scene. I shall not spoil it for you here as I want you to pick up this issue. It’s titles like these that really need your support as it doesn’t feature the A-List super-hero marquee names. However, because it doesn’t star the big guns, change can truly happen to the characters. Who would’ve thought John the Skrull would’ve met such a tragic end or that one of their own would betray them last issue? This kind of ensemble cast leaves the reader guessing in a good way. The recent issue features Dracula and Doom on the moon, making plans to conquer the world! If that doesn’t grab you, I don’t know what will. Maybe you like Blade the vampire hunter? Give this title a shot. I think there’s something in it for everybody. Above, a panel by Marc Silvestri featuring Storm getting a makeover as led by Dazzler, and assisted by Rogue (in her Carol Danvers persona) and Psylocke (pre-nimbo version). Storm plays the square by not truly enjoying the idea of embodying even more spectacle, but proves to be a good sport in spite of her reservations. It’s good to have girlfriends when you’ve been worshipped as a Goddess your whole life! I gave couple’s tarot reading’s last night at the Supper Club with my X-Men tarot deck. I should clarify that. I gave readings using a playing card deck adorned with images of the X-Men from the 90s. I have worked out a system in which I can divine with the images and the Minor Arcana inherent in the playing deck. Some of you dear readers may be surprised to know that the playing card decks you’ve been using for poker and old maid actually descended from the tarot. They simply lack the Major Arcana. A lot of Supper Club patrons were interested in why I sused this deck and why my name was legally changed to Storm. I now share this answer with you, dear reader, as I did them. Simply put, Storm was the only real role model I had growing up. Her character embodied compassion, kindness and grace. I vowed to use that as my inspiration and when I use the Mutant Oracle, I put that vow into action through divination/reflection. In this panel plucked from a classic Chris Claremont and John Byrne issue of the Uncanny X-Men, Storm’s compassion for others has overwhelmed her. Luke Cage acts as the voice of reason, reminding her that they can’t save humanity from itself. A telling moment in the early story of a Goddess come to earth. In Uncanny X-Men #100, the All-New, All-Different X-Men fight the original five (plus perennial hangers on Havok and Polaris). 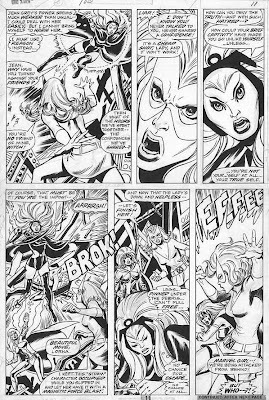 As Storm states, she could easily take out the somehow weaker version of Jean Grey but decides that she cannot attack her good friend (the first one she ever really had that was a peer). Her compassion leads her to use reason to try to understand what is happening and this leaves her vulnerable to Polaris’ attack. I remember when I read this for the first time, I was impressed with Storm’s ability to sense when things were awry. She and Wolverine have this trait in common; Wolverine uses his physical senses to let him know when things don’t smell right and Storm’s empathic oneness with nature alerts her to the falseness of this situation. The Jean Grey in this fight is actually a robotic duplicate (an X-Sentinel). Of course, Storm figures this out too late. Those “EEEEE”s you see on the last panel? That’s Banshee to the rescue, dear reader. This page is drawn by Dave Cockrum and written by Chris Claremont. The meme of X-Man versus X-Men will be trotted out again and again over the years. It’s an oldie but a goodie as far as I’m concerned. I never grow tired of seeing the good guys beat on each other. Sometimes we really are our own worst enemy.